For years I've occasionally but repeatedly used Tapatalk to check the forum from my Android devices (tablet and smartphone). As said, it's not a logon problem, but an access problem. To help identifying the cause I add that Tapatalk works fine with other forums, and the same issue exists from two different Android devices. '>' is an unexpected token. Expecting white space. Line 1, Position 10. I am not sure whether or not it has anything to do with some recent update of Tapatalk apps or this forum, though. I have lots of forums connected in Tapatalk and have seen a couple of issues now and then with other forums too lately. Well, another issue is that with Opera when you click on the "login" button the stupid popup comes out in a fixed position at the bottom of the screen (that cannot be scrolled down) so that you cannot enter Usename and password. Luckily by selecting "custom mode" in Opera, the fields appear in the (blankishly formatted) page at the bottom and the page can be scrolled down thus the data can be input. I can login now but the popup comes out in a fixed position at the bottom of the screen in Firefox, and only name and password are visible nothing below that, it's required to press enter to finally login. Well, you have an advantage on me , in Opera only the upper frame of the pop-up is visible, (no user field, no password field visible) unless I switch to "user mode". Now the popup comes out at the bottom left side of the screen in Firefox, it is not visible; it is required to reduce page size to find it. Let me suggest to put it centered at top of page to allow every body see it, perhaps the man in charge of forum software is running in a big monitor and using maximum resolution, so he can see it very fine but other people not using that resolution can't. The resolution I'm using is 1024x768. How I wish web developers could stay away from this modal popup style altogether. Of course I see there could be scenarios where it could be useful. But since there are so many ways to implement this standard in the browsers and so complicated to code it correctly on the web site, it is almost impossible to make useful use of it. To be fair, though the developers of the board software are particularly unfriendly and obstinate in their wrong developing procedures , this time it is not their fault. It is all in the design of this board, i.e. the one that should be blamed is either Nuno or Mikorist (or both ). The SAME "login" page is available also on reboot.pro, only seemingly it is NOT linked to anywhere . Ah! Thanks for that one! It even seems to work correctly on Internet Explorer 10 on Windows Phone, which is often far too strict/brutally stupid about how to guess where modals should be drawn. I don't know whether the problems mentioned by others here are related to the one reported by me in the OP, that for sure (?) has to do with something that has happened to the forum after the beginning of last week, because, as stated, I have always accessed regularly with Tapatalk until then. Moreover, unlike others, this issue can't be worked around with imagination and access from Tapatalk is IMPOSSIBLE. Do you mean that with Tapatalk (whatever it is) you cannot get this page displayed? As said it is the same page as on MSFN (though MSFN has the duplicated login fields on the main page). Tapatalk is an application that could be used to access many different kinds of forums that have a Tapatalk server-end module installed. The client side application communicates with the server-side module using a webservice interface. It has happened before and will probably happen again that updates to either client-side Tapatalk applications, server-side Tapatalk modules or the authentication mechanisms used by underlying forums cause the whole thing to not function properly, with various levels of strange results or failed logons. Tapatalk is an application that could be used to access many different kinds of forums that have a Tapatalk server-end module installed. Good to know , in my utter ignorance I thought it was just some kind of "slimstreamed/optimized" web browser "tuned" for forums on portable devices, not that it had it's own communication protocol/server/client/whatever. No, I get no login page displayed, but this is normal. The software does the login with the saved username and password, without showing the user a login page. That's why nothing can be done to workaround the problem. You either enter or not. Besides, as said, the problem is not with login, but rather with access. Same error (see OP) when accessing as a visitor with no login data. I have done no client update and continue accessing and logging in to (say) MSFN and other forums. And, finally, my Tapatalk version is Android, different from the one shown by Olof which is Windows8, though its functioning is the same. Yes, but it is still Tapatalk and it uses the same communication and authentication on all platforms. It also feels mine and yours stopped working around the same time, more or less. I had recently updated my client side application so I thought it was related to that only. But since you have the same problem on Android it seems more likely that there has been some changes on the server side. I also hope it could be corrected soon. Tapatalk is a little bit easier on mobiles, even if the website works pretty well on my mobile too (if I stay away from modals, that is). On reboot server, I guess, not Tapatalk. As said I continue using Tapatalk with a few other forums. Yes, I mean the server-side component at reboot.pro forum that connects the Tapatalk protocol with the underlying forum software. I agree that it is probably not related to Tapatalk servers. They only keep an index of available forums and related service URLs, pretty much. 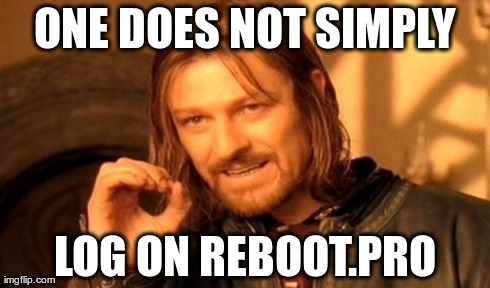 The only issue I could think of could be if Tapatalk servers have an old service URL registered for reboot.pro specifically, in which case the application would not be able to communicate with the reboot.pro forum but would be able to communicate with other forums. As you would guess, I couldn't login. One should remember the login link or shorten it to be easier to login when the normal way fails ( Or just always). One should remember the login link or shorten it to be easier to login when the normal way fails ( Or just always). The process is called "simplification" or "progress" (a few call it "senselessly making things more complex than needed" ). The server seems to be under improvement. If you have more than 100 posts and didn't posted funny cat pictures over the last 24 hours then the system doesn't permit you to login. Let's see if this gets sorted soon. Will soon post cats to keep my login link active. I'm having similar issues. I was able to login with FireFox / Chrome using the link Wonko provided. Thankfully, copy/paste actually works in those browsers, unlike IE (which used to ask me whether I wanted to allow the website to access my clipboard, and has recently decided to stop doing so altogether). However, that's not the end of the ordeal. 1) When I click My Media with either FireFox, or Chrome, the whole screen dims again. Nothing pops up. So I cannot create spoilers in posts I create. 2) This might just be me being a newb; but I also cannot find where to create/edit my signature.